The construction of two cable percussive boreholes with regular in-situ testing and sampling. Three window sampler boreholes with regular in-situ testing and sampling. The installation of three 25mm diameter dual purpose land gas and groundwater monitoring standpipes within the window sampler boreholes, sealed using bentonite pellets with 10mm pea shingle response zones. Three Dynamic Probes to determine the relative density/consistency of the materials encountered. The excavation of four trial pits in order to reveal and record the existing foundations. Geotechnical testing in order to classify the soils for foundation design purposes. Chemical analysis in order to form an assessment of the geo-environmental conditions present and any necessary remedial measures required. 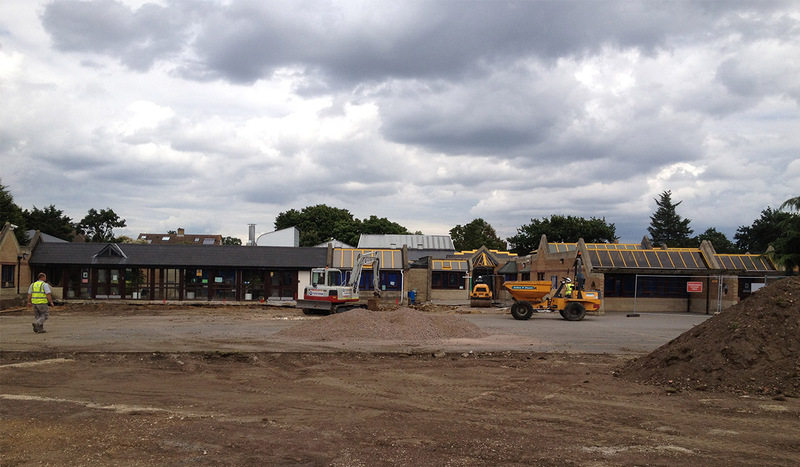 Geo-Environmental undertake an investigation of the geotechnical and environmental factors pertaining to the proposed development at a Primary School on behalf of Jacobs UK Ltd (design consultants) and the London Borough of Richmond Upon Thames. The proposed development was to comprise the construction of several extensions to the main school building. With the proposed development underlain by a succession of River Terrace Deposits and London Clay, and with the presence of several mature and semi-mature trees along the north western and north eastern boundaries, as well as to the south-west of the main school building, engineering advice was needed for foundations, excavations, sub-surface concrete and soakaways. Advice was also required on the environmental quality of the near surface soils with respect to the potential receptors. Geo-Environmental’s experienced team with its broad knowledge of investigation techniques and experience of managing and implementing a number of similar projects for Schools, provided advice on foundation recommendations, excavation stability, concrete class, pavements and soakaways. Whilst this was a relatively routine investigation technically, the location of the site in an operational school which was open to access to members of the public, meant that an understanding of how to safely conduct an investigation in these conditions was the most important aspect of this project. Because Geo-Environmental appreciate and understand the risks on conducting site investigations in public places, it makes it a safe choice for our Clients to use our services. Of primary importance was the requirement for strict protocols in respect of Health and Safety for the workforce and in particular, the staff and students of the schools, as the works were undertaken during term time. The client confirmed that they were very impressed with all aspects of Health and Safety protocols undertaken by Geo-Environmental, and in particular, our comprehensive site specific Method Statements and working Risk Assessments.